A case or providence – we don’t know what made you visit one of sites of many Ukrainian dating agencies and catalogues of ‘brides by mail’. Now it’s not important. Another thing is important – it’s where you met a woman of your dream, you are happy and in love, and now you seriously consider mutual family life ahead of you. Surely, as a real man you would very much like to arrange a luxury and memorable wedding for your beloved one – as it’s the main event in her life. And, surely, it is desirable that the event remains in ones memory as a bright and unforgettable day. Is it right? There is nothing easier! Make a Ukrainian wedding! An unexpected offer? One must think? Think, consider all pro et contra, count, and meanwhile we will try to acquaint you with main traditions and customs, classical ‘magical’ rituals of a Ukrainian wedding for you to really plunge into an atmosphere of this ceremony. 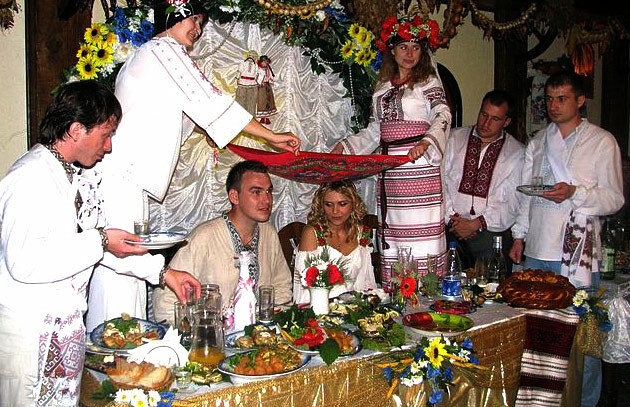 A Ukrainian wedding is a real ritual drama which lasts not for one day, which is always accompanied with songs, dances, contests and games. This is a folk holiday with a huge quantity of invited guests and a huge quantity of food and alcoholic drinks. A Ukrainian folk has 3 main types of rituals – pre-marriage, marriage, and after-marriage ones. Every of them consists of definite rituals: pre-marriage – marriage brokerage, viewing of the bride, engagement, bridal shower, and marriage itself – a feast, presents exchange, a corbeille, a load etc. On a Ukrainian wedding there are wedding ranks every one of which performs a special role (everything described is a classical common variant which can be accompanied with an endless quantity of various variations. That’s why having heard a cry ‘bride has been stolen’ or having seen a mother-in-law in mud and in torn clothes on a cart don’t be too much nervous! All this is a part of traditions. -	The second wedding day. Extreme entertainments.